Dr. Kamal Al Abdi completed his study as Doctor of Medicine from the University of Vienna, Austria and did his Post-Graduation in Internal Medicine and interventional Cardiology gaining profound training. He worked thereafter for 10 years in one of the busiest Cath labs there and performed many elective and acute procedures for patients with severe and complicated coronary artery diseases. Dr. Kamal has worked as a Consultant Internal Medicine and Cardiology for more than 14 years, he is experienced in the management and treatment of cardiac patients, covering almost the entire spectrum of cardiovascular diseases. Dr. Kamal has worked in Al Ain Hospital, from August 2010 to September 2015 where he was the Head of the Cardiology Department. He commissioned the Cath lab there and established a 24/7 intervention service regime for acute heart attack patients (STEMI). Quality and volume of other cardiac services such as CCU, general ward, non-invasive cardiac labs and improved the service levels of the OP clinics. Under his stewardship the coveted JCI accreditation and its re-accreditation were achieved. 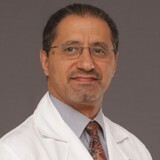 Dr. Kamal’s areas of interest are coronary artery disease, performing of left and right heart catheterization, coronary angiography and angioplasty with/without stent implantation, performing of acute angiography and intervention for patients with acute MI, insertion of temporary pacemaker and haemodynamic support devices (intra-aortic balloon pump, impella) for patients in cardiogenic shock, management and follow up of patients with arrhythmias, heart failure and valvular diseases. Dr. Kamal has obtained the American Board registration as a Certified Professional in Healthcare Quality. Dr. Kamal was involved in organizing of CME programs in and out of the hospital, teaching of medical students and junior doctors, training and supervising of colleagues in non-invasive cardiac lab and in Cath lab. He is proficient in Arabic, English and German.